This is a part of our series about global megatrends. Please read the introductory post. Once upon a time, huge corporations were a safe haven to young, aspiring academics. Graduating students received their university diploma and started their corporate career. Promotions were usually based on the employees’ adaptation to the corporate culture and their seniority. The ability to perform repetitive office activities was the most important skill. Alas, the predictable world of cozy bureaucracy with comfortable 9-to-5 jobs is in full retreat. The almighty Globalization demands a different, more agile organizational form: the Project. Traditional, old-fashioned bureaucracies once had their justification in the business world. That world used to resemble a huge, steady-going steamship, moving in a direction defined long beforehand and rarely changing course. Several industrial revolutions, though, have radically changed the rules of the game. This aspect is discussed in detail in our article “The Dying Diplodocus”. To summarize its conclusion: in product-developing organizations, only a “projectized” organizational form makes sense. Businesses that manage to restructure themselves successfully into projectized organizations become fierce T-Rexes among their peers. They achieve unmatched time-to-market agility that is one of the most important skills of today. Except for certain areas such as government bureaucracies or manufactures, the old-fashioned matrix organization is on the verge of extinction. The Project shall prevail. Project management knowledge and experience will increasingly become a key argument in many salary negotiations. Job-hopping will become more common and less objectionable by HR departments. Freelance and interim project management and engineering jobs will thrive. As a result, the loyalty of employees to their employers and vice versa will decrease. Because of the rarity of certain project management and engineering skills, projects will become increasingly multinational and multicultural endeavors. English will often be the official project language. Willingness to travel extensively will be an important requirement for team members. Due to an increasing number of freelance experts, governments and especially social lobbies (i.e. social-democratic parties and unions) interested in ensuring a steady inflow of funds will often attempt to prevent citizens from exiting expensive social security schemes. They will push for legislative changes to make it difficult, risky, or even impossible to hire freelance or self-employed experts (marketing it to their voters as “disguised employment”, for example). This will frequently shake up the freelance and overall job market, affecting the career outlooks of many. Vertical social mobility will be a global phenomenon. As businesses press their government to allow foreign experts to temporarily join projects, well-educated experts from emerging countries will find better career opportunities on the global level. The hiring process will become a different task. Looking for project members will be performed globally. Also, temporary (contract) employment will be more of a norm. 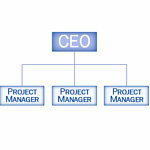 The entire organizational structure will change towards projectized forms. Project managers and technical experts will have to be promoted to wage levels previously common for C-level executives. Especially during the transitional periods (from matrix/bureaucracy to projectized forms), tensions and uncertainty will have to be overcome. Outsourcing on all levels will return as a megatrend. This time, instead of production processes, entire project teams will often consists of temporary employees and freelancers who will be unwilling to accept permanent positions at lower wages. Companies will thrive with a small, permanently employed core team and an extensive network of suppliers. Due to the temporary nature of the work relationship, data security and the danger of leaking sensible internal information will be a huge issue. Clever technical solutions will have to be developed to minimize this risk. The time-to-market-pressure will further increase. Nothing will be as important as execution and salesmanship. Is this fast moving, swiftly responding, turbo-charged and restless world on steroids sustainable? Is a world driven by projects delivering short-lived solutions and ever-new services and products becoming a better place for Homo sapiens? One may argue that Mother Nature has not equipped us with what it takes to thrive in what might appear to be such a ruthless, unnatural environment. Whether or not, it actually does not matter much. If this is an aberration then we have no other choice but to get used to it. Time has become the most precious asset, and no modern business can effort wasting it. Projects are an organizational form that is best suited to bring tangible results quickly. Because of that, projectized organizations are the up-and-coming market leaders. People who enjoy change and actively tackling new challenges will enjoy this development. Others will have to endure it – or learn to enjoy it – for our perception of the modern world is the only choice we all share.